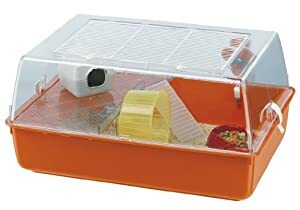 The Mini Duna Hamster Cage is a small cage with a deep plastic base tray and a clear plastic upper section that has a wire mesh lid in the top of it - very important to help maintain ventilation and air flow with the cage. It also comes with a house, food bowl, water bottle and exercise wheel. The small size of this cage makes it unsuitable for Syrians but according to reviewers (follow the links in the table below) can quite happily accommodate a couple of dwarf hamsters. The interior of the cage has enough room for an exercise wheel with just enough space for additional toys. The cage has a raised shelf on which a hamster house will sit quite nicely. The base and upper section fit together by way of large clips at either end making it a doddle to separate the two for cleaning. One thing to be aware of is that it seems the hole through which the water bottle enters the cage is formed to best suit a Ferplast bottle so you may be restricted to Ferplast for replacements. We're grateful to be of service and bring you content free of charge. In order to do this, please note that when you click links and purchase items, in most (but not all) cases we'll receive a small referral commission from organisations such as Amazon Associates. Your support in purchasing through these links enables us to keep the site going. Please note that this makes no difference to the price you pay for any items you purchase.